"You can do it, all you need is a hand. When in 2012 Imelda Staunton was playing Mrs Lovett in Jonathan Kent's production of Sweeney Todd in London transferring from Chichester, it was Stephen Sondheim who suggested that she should play Mamma Rose in Gypsy. 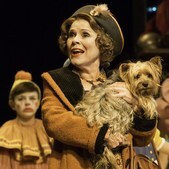 An excellent casting choice because not only can Imelda Staunton belt out the anthems from Gypsy but she can also give the complexities and contradictions of the role of a selfish, grasping mother filled with ambition for her children but fixated on vaudeville, a fading, out of date theatrical genre. We see her daughter Louise (Lara Pulver) finally assert herself away from her mother's apron strings, via an uncomfortable occupation for modern feminists to witness as the "naughty but nice" burlesque entertainer, Gypsy Rose Lee. On that journey there are plenty of depictions of pretty ghastly vaudeville, the children, flesh cringingly cutesy and squeaky Baby June (Gemma Sutton) singing Shirley Temple style to her pet cow, one pair of legs played by her elder sister Louise. There is a huge body of Gypsy fans living in the UK who have been deprived of seeing this musical on stage. They love the elaborate overture and the half dozen stand out songs. Initially it took 14 years to reach London from Broadway with Angela Lansbury in the role of Momma Rose. This production at the Savoy for them is seventh heaven. Both acts close with Mamma Rose's "Everything's Coming Up Roses" and "Rose's Turn" which got a standing ovation. I liked Stephen Mears choreography with the stand out solo by Tulsa (Dan Burton) which has him poignantly dancing with the hopeful Louise only to elope with her sister. I loved the aging of the child stars in taking a leaf out of Matilda's book, through the strobe lighting, they metamorphise into their older selves, dancing all the time. The three burlesque artists Mazeppo (Louise Gold) , Electra (Julie LeGrand) and Tessie Tura (Anita Louise Combe) bring the house down with their clumsy routines of bump and grind which serve to contrast with the all the more delicate, Gipsy Rose Lee, whose mother has reminded her to be ladylike. I shall never forget the expressive way Rose says to Herbie (Peter Davidson), "You're not married? "In that question with a lift to her voice she implies hope, surprise and an eagerness to get to know him better. Then of course there are Sondheim's wonderful lyrics and his light wit with many bon mots dropping from Momma Rose's lips, "After three husbands it takes an awful lot of butter to get you back into the frying pan!" There are so many changes of set from Anthony Ward for the many cities Rose took her troupe to from seedy boarding houses to theatrical back rooms and the glitz of Minsky's in New York where the waitresses spoke French. Gypsyhas just missed the cut off date for this year's Oliviers but you can bet that Imelda Staunton will be in next year's nominees for her impressive acting while singing. Lara Pulver turns from a gawky girl to a real beauty and learns to cope with her mother's put downs. Are we convinced that given the opportunity, Rose would have been a stand out star? Not with her lack of skill at picking good shows. The real life legacy of Momma Rose was that June Havoc was a successful film actress and plain, less talented in her mother's eyes, Louise, was the toast of burlesque queens in the 1950s. Both very successful. Was this in spite of their mother's ambition or because of it? Aye there's the rub for ambitious Stage Mommies.